Welcome to Vamos Paella – the best Paella and Tapas caterers in town. Want an unforgettable culinary experience? This is how we do it. We arrive at your venue armed with positive energy and radiant smile along with our fresh garden herbs, quality ingredients, seasonal produce, paella grills, and pans. We settle in your backyard and set up our outdoor kitchen. While we are preparing tapas, desserts and getting our ingredients ready to cook paella in front of you, we can even set up your venue to make it festive and colorful. Spanish and Flamenco music can also be arranged. Showtime – the paella pan is set up to start live cooking and once done its served to your guest coupled with a glass of wine or chilled sangria. We bet, your guest will feel they have been transported to Spain for a few hours. Your event is sure to be an unforgettable culinary experience that everyone will be facebooking, instagramming and tweeting for days! Does this sound interesting? All you need to do is contact us. Tell us about your event, proposed date, time, number of guest, venue, etc. After an initial meeting, book our Paella and Tapas catering services and just drop a line regarding any special favors. On the D-day, just sit back and relax. In no time your dream venue will be ready and our chef will be cooking up a storm right in front of your guest. At the end, we clean up everything. Paella adds a good focal point for your admiring guest and is a great opportunity for photographs. 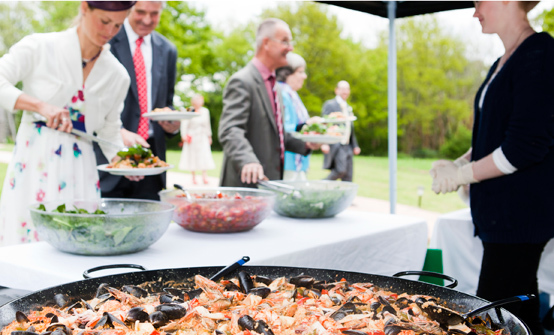 Combined with our bespoke services, paella, and tapas catering is an interesting alternative for any party, wedding reception, function or corporate event. Remember, there are a million ways to have an event with friends. 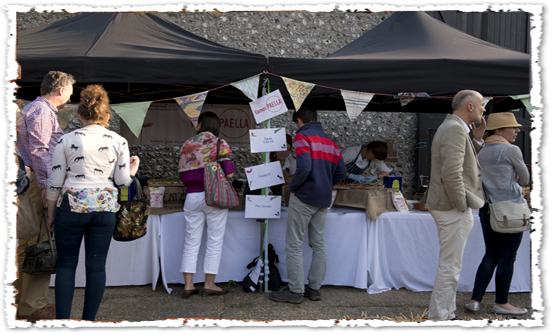 What we – Paella and Tapas caterers – do makes your event stand out above the rest. We create an artistic and colorful experience. Book a tasting session with us; it will be worth a million words.